Fans of the gentleman's game will be reeling in an overload of limited-overs cricket with nothing but the shorter formats of the game being played since the start of the year. It will come as a relief to many fans who appreciate the longest format more that normalcy will resume when Sri Lanka take on England in the first Test of the summer on Thursday. Both the sides have gone through a lot of changes since the last time they met in 2014. Sri Lanka had beaten the hosts in all the formats in the 2014 tour of England. Currently, though, Sri Lanka are a team that have been struggling through the phase of transition since two of their stalwarts, Kumar Sangakkara and Mahela Jayawardene, bid adieu to international cricket. England are one of the best Test teams right now. While England is fourth in the ICC Test Rankings, Sri Lanka are languishing in the seventh spot. Flashback to two years ago, May-June 2014. Sri Lankan cricket was booming with a perfect blend of experience and youth in their ranks. Sangakkara and Jayawardene were in their prime following their success in the 2014 World T20 defeating India in the finals. Unlike how it is going to happen this time, the 2014 series started with the limited-overs formats. Sri Lanka won the only T20I in what was a close contest. In the ODI series, both teams won two each after the first four matches. In the fifth ODI, Sri Lanka came up with the right goods and subjected the home side to another loss. However, the fifth ODI was marred with some controversy as Jos Buttler was mankaded by Sri Lanka spinner, Sachithra Senanayake. This added some spice to the remainder of the tour, with two Test matches remaining. Having lost both the T20I and ODI series, England needed a good response in the Test series and finish on a high. A transitional English side handed Test debuts to Moeen Ali, Chris Jordan and Sam Robson in the first Test at Lord's. Sri Lanka had won the toss and chose to field, and would have hoped to bowl out the home side for a low total. However, the England batsmen made merry and piled on the runs putting up 575 on the board. England's best batsman, Joe Root made his highest ever Test score and remained unbeaten on 200 to lead the run surge. In response, the visitors were powered by twin centuries from Kumar Sangakkara and captain, Angelo Mathews. Having been 400/5 at one point of time the visitors would have hoped to get closer to the hosts’ total or at least finish close behind them. A late collapse saw Sri Lanka lose their last five wickets for just 53 runs and gave England a 122-run lead. When the home side came out to bat in the second innings, they faced the wrath of Shaminda Eranga and Rangana Herath, who picked up seven wickets between them. Gary Ballance's century was what saved England from embarrassment as they had a lead of 389 runs at the end of Day 4. Any total of 300 and above is not an easy task to chase down on the last day of any Test. With this in mind, Sri Lanka played for the draw and played slow. At tea, Sri Lanka were 164/3 and seemed to slowly inch towards a fighting draw. However, Sri Lanka lost six wickets for just 32 runs with the eighth and ninth wickets falling in the 87th and 89th over respectively. All the last two batsmen, Eranga and Nuwan Pradeep, had to do was survive the last five balls. Pradeep was the man on strike and Stuart Broad was the bowler. In the fifth ball of the last over, Pradeep was wrapped in front of the stumps and umpire, Paul Reiffel gave the batsman out sending the English players into celebration. Pradeep immediately sent it for a review and the third umpire found that there was an inside edge and turned down the on-field call. Pradeep edged the last ball of the match, but it fell just short of the second slip fielder. 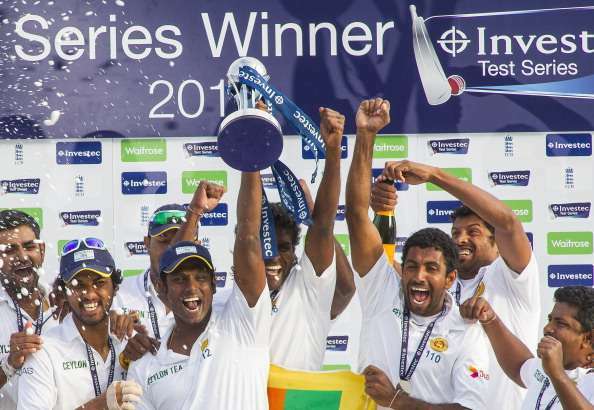 Sri Lanka survived the match and earned one of the most thrilling draws in Test cricket.